Speak in French when you can't think of the English for a thing. Pizza is international, it is universally understood in all countries I believe and hope, but does not matter, because this should be filed under nonsense. 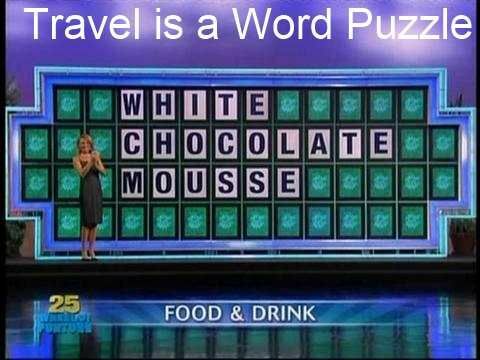 Travel is similar to the word puzzle game show called "Wheel of Fortune." I am constantly trying to guess what foreigners, travelers, and tourist are talking about. Nodding your head as you look around, just continue to say. They will not be offended; they may even surprise you and talk and talk about Pizza. Alternatively, like the word puzzle game Wheel of Fortune. I will bid on a "Subject to the Sentence." "Pat, I would like to buy a ‘Subject’ for $250." I want a subject to the sentence please. Careful at the bid price, you do not want to confuse the talkers, for example in Guatemala you will need to qualify your money, are you talking 250 Quetzals of 250 Dollars. I suppose I am controlling, but I also get bored of listening the insane monologues. Therefore, when I am sitting in a group of foreigners who obviously have lost the plot, I have learned to change the subject, they do not care, any subject is fine, just providing you allow their filibuster to continue. On the other hand, talk about "Conspiracy Theories," I guarantee travelers are excellent students. This is good fun as the Brits say, and please try to not "Take the Piss" as the Brits also say, but generally learning to change the subject should be game, because for sure nobody is listening. I am quite positive, if I would have just written. Generally, it would have achieved the same result; normally a person has stopped reading by the time the got to the end of this word puzzle because, well, that is simple. I am talking and they are not, welcome to the new world.